It's the end of December, which can only mean one thing for travellers — contending with throngs of people flying in and out of airports en masse. Yes, this whole month is normally a hectic time of year to travel by plane, but for some, it's all that stands between them and a hot turkey dinner on Christmas Day. To help travellers get into the festive spirit, airports have assembled everything from miniature Christmas trees to full-out Christmas markets. But one airport is taking a more unique approach when it comes to the season's greetings. Those with loved ones travelling to Pearson International who are in need of Christmas cheer can receive some in the form of a personalized carol. 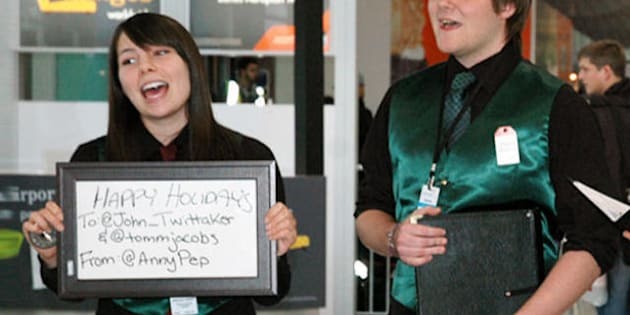 The Toronto-based airport's Tweet A Carol program is now in its second year, and offers the chance for family and friends to share the Yuletide through a song sung especially for them (complete with a board with their name, a la the Arrivals terminal). All that's needed is a first name, last initial, flight number and the date of travel, according to the airport's website. Tweeters can choose from one of ten classic songs, like Feliz Navidad or Santa Claus is Coming to Town, to send to travellers at terminals 1 or 3 — but the airport makes no promise its carollers will be able to deliver the right tune at the right time. Carollers are available from 3 p.m. to 8 p.m. on December 23, and from 6 a.m. to 11 a.m. on December 24. The airport's gesture comes at a time when travel in North America appears to be at a divide. According to a study conducted on behalf of Cheapflights.ca, Canadians have the intention to travel to visit family and friends, but fail to follow through this time of year. The survey of 400 respondents suggests that 80 per cent of Canadians want to travel during the Christmas season, but less than a third have made concrete plans. On the otherhand, travel from the States, during the holidays is at a six-year high, reports the Los Anglees Times. What do you think of Pearson Airport's holiday gesture? Feel free to sound off in the comment section below.